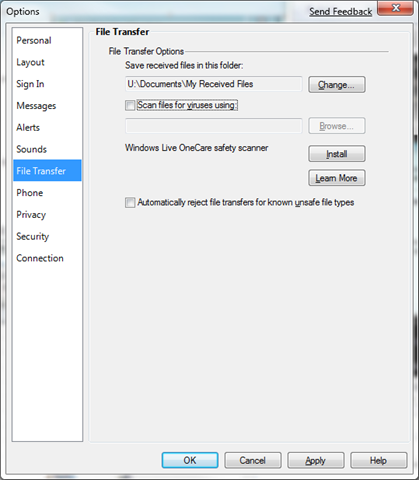 How to Get Rid of the Pesky antivirus Check When Sending Files in MSN Messenger…? 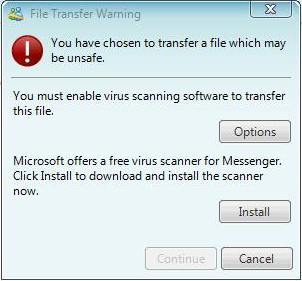 The boffins who build MSN Messenger decided a few revisions ago to introduce a security check into messenger that doesn’t allow you to send files such as zips to other contacts unless you have antivirus installed. It’s a nice feature to stop 12yr old girls from sending around, but it’s quite annoying if you’re running an OS like Windows 7 with UAC on because the need for antivirus software is only as great as your stupidity for accepting crappy files. In fact, I have been antivirus free on my laptop for the past year just because I don’t see the need for it when UAC is on and simple precautions are taken. Anyway, I tried to send a valid zip to my colleague today and got the little warning. Of course, I can’t continue because I don’t have antivirus installed. Or can I…? 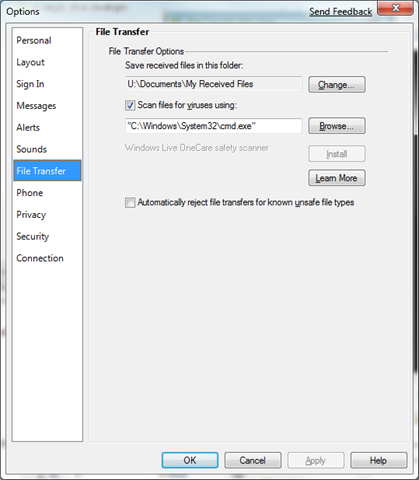 I clicked Options and got my File Transfer settings.